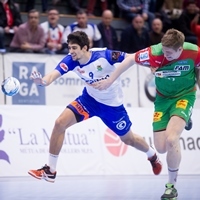 09.05.2016 - OFFICIAL STATEMENT: The EHF Court of Handball has ruled out the player of the Swedish club for one game following his unsportmanlike conduct in the group phase match at Helvetia Anaitasuna. 30.03.2016 - FACTS AND FIGURES: Before the last steps towards the EHF Cup Finals will be taken, here are the most important numbers of the competition so far. 27.03.2016 - REVIEW: Ystads IF meet the bitter destiny of being the only second-placed team not to reach the quarter-finals of the Men’s EHF Cup. 26.03.2016 - EHF CUP REVIEW: Both of Saturday’s Men’s EHF Cup Group Phase matches ended with wins for the away side.